When it comes to wedding planning, one of the most stressful things is the guest list. Not only can it create conflict, but how many guests you invite may well be one of the largest factors in your budget. The average number of guests for American weddings hovers around 120. While that may sound like a reasonable number, it also translate to an average budget of just over $35,000, according to a survey conducted by The Knot. For some couples, that just isn’t’ feasible. Tana and Zeb’s wedding was far from traditional: the ceremony took place in the aisle of an independent Chicago bookstore. The guest list? 12 close family and friends. 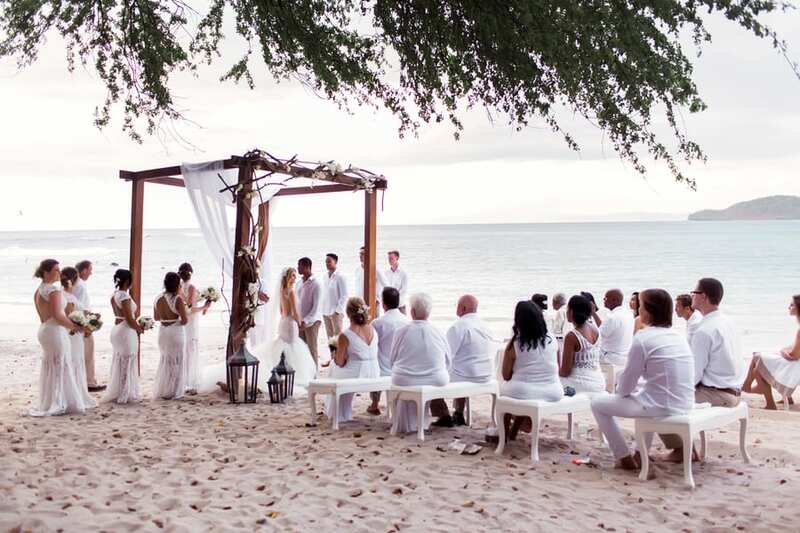 While it might not be for everyone, intimate, or micro weddings, generally understood as under fifty guests, are a solution to the headache and financial burden of planning a large wedding. Micro weddings can take place anywhere, from traditional church venues to parks to estates. The best part? Less people means spending more time with loved ones, without feeling the pressure of inviting colleagues or other more casual or professional acquaintances. Personalization is key: From an unique bridal gown to DIY details, to a signature cocktail or serving old family favorites for dinner, having a smaller wedding means you can really focus on making it meaningful for your and your loved ones. Instead of worrying about appeasing or impressing, focus on decorations, food, and a venue that is meaningful not only to you and your future spouse, but the two families involved. Avoid hurt feelings (as much as possible): Know this: if people know you are engaged and are not invited to the wedding, not everyone will understand. It might be good to be upfront ahead of time and explain out of necessity, the event will be for family members. And advice column on Huffington Post suggests you include others by livestreaming, sharing photography, or even having an informal separate reception after. Make it clear to anyone who inquires that you care about your relationship with them, and would invite them, and more people, if you could. Enlist help: One of the biggest mistakes you can make is not asking for help. Even a small wedding takes a good deal of planning, from selecting the perfect attire to the venue to the food and entertainment. If you don’t want to spend on a professional planner, see if a family member would be willing to help. Chances are, some will. The only key: make it clear they are not obligated to help. Need some more inspiration? Check out these great DIY ideas and then shop for your accessories and gown to match your theme.